A Forsus appliance is a fixed appliance that works on the upper and lower teeth at the same time. It works by pulling the top teeth back and pushing the bottom teeth forward so that your bite matches up. Your options to correct Class II malocclusions have traditionally been limited to products that are easy to install but require patient compliance or products that are fixed but are difficult to work with. WHAT DOES THE FORSUS APPLIANCE DO? The forsus is used to correct class 2, patient’s jaws that the upper jaw and teeth protrude over the lower jaw and teeth by a lot. It is not used in all cases but the more extreme cases that the orthodontist thinks that normal orthodontic elastics may not be able to correct or the forsus would correct it faster. This can reduce time in braces limiting or basically eliminating the use of regular orthodontic elastics. The forsus helps the patients that may not remember to wear a headgear or the elastics and can also possibly prevent the need for expensive jaw surgery in some case. The appliance is made to align the teeth and reduce the overbite and promote the proper jaw growth in patients. It is mostly used in adolescents because that is the time the growth of the jaw in mainly taking place. Once the appliance is placed in the patient’s mouth it needs to stay there for 6 to 9 months depending on the severity of the case. There are numerous advantages to using a Forsus appliance over conventional class II bite correction methods. Forsus appliances can correct the bite problem faster than rubber bands for many patients and are more comfortable to wear than bulky headgear. Additionally, patients don’t need to remember to wear their headgear or rubber bands as the Forsus appliance is working all the time. The appliance may also help to prevent the need for expensive jaw surgery in the future. SOME PROBLEMS YOU MAY RUN INTO WITH THE FORSUS APPLIANCE? Sometimes if you yawn or open too big the rod may come out of the spring module. Do not panic! You should be able to place it back in. What you will need to do is open as big as you can and place the lower rod that is attached to the lower arch wire back into the spring module. The spring is hollow inside allowing the rod to be inserted easily. You may need to pull back the spring module to get it placed in there. If you are unable to do this you should call your orthodontic office promptly. Never go without it placed in the spring. It can cause problems if eating or even talking with the rod hanging loosely. 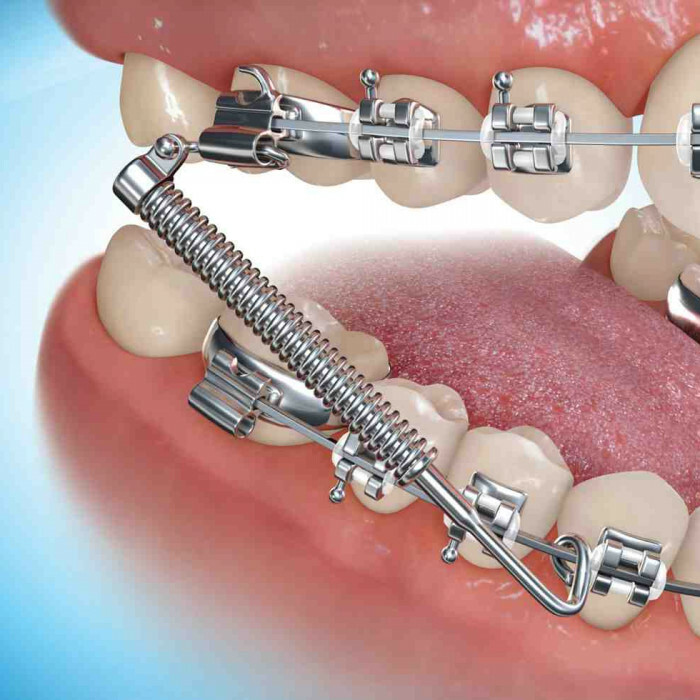 The Forsus appliance consists of spring coil rods that are permanently affixed to the patient’s braces. On each side of the mouth, the metal bite spring is attached to the band on the first upper molar. It is then connected to the lower front arch wire. It works similarly to traditional orthodontic rubber bands, however, it does not need to be replaced by the patient. The Forsus appliance is used to reposition the jaws in growing patients whose upper jaws and teeth protrude over the lower jaws and teeth. The appliance improves the alignment of the teeth, reduces overbites, and promotes proper jaw growth in adolescents. The Forsus bite springs stay in place for six to nine months. The treatment time depends on the severity of the problem and the size of the patient’s jaw. The appliance needs occasional adjusting during the course of the treatment period. Adjustments are typically made every eight to ten weeks. For most patients, the springs do not affect eating or speaking after the initial adjustment following placement. How much do I need to wear the Forsus Appliance? The Forsus are permanently fitted onto your top and bottom teeth. For the treatment to work, the appliance must stay in your mouth for 6 to 9 months. It is likely to be uncomfortable for the first two weeks after the Forsus appliance is inserted. What should I do for the first 2 weeks? It is important that you brush three times a day and use a fluoride toothpaste. If possible, carry a brush with you for use after lunch. Keep the Forsus springs very clean by checking the entire appliance after brushing to make sure it is shiny. If plaque bacterium is allowed to remain on the appliance, it will appear dull and may cause sores (ulcers) to form inside your mouth. Please call the office if sores develop inside your mouth. What do I do if my Forsus breaks?